Lightweight feather-like earrings are splashy but comfortable to wear even if you are not used to big jewelry. 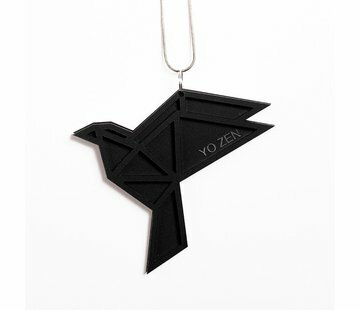 We dare to bet that wearing YO ZEN earrings you will inevitably gather compliments. Our earrings are perfect for spicing up ordinary work days or for bringing style to festive occasions. Our earrings are made by laser cutting and engraving in Finland. The metal parts are stainless steel. The materials for the earrings are acrylic and both walnut and birch plywood. Our earrings are perfect for all age groups, and that is why our popular origami swan, for example, is also a great idea for a gift.